It takes a four- to six-night trip in order to comfortably complete this 45-mile loop. Two factors make this a tricky route: the often-impassable road west to the South Bass trailhead, where this route begins, and the need to rappel during the descent. The reward, though, is the spectacular lower Royal Arch Canyon, one of the most beautiful places in the canyon weve been. 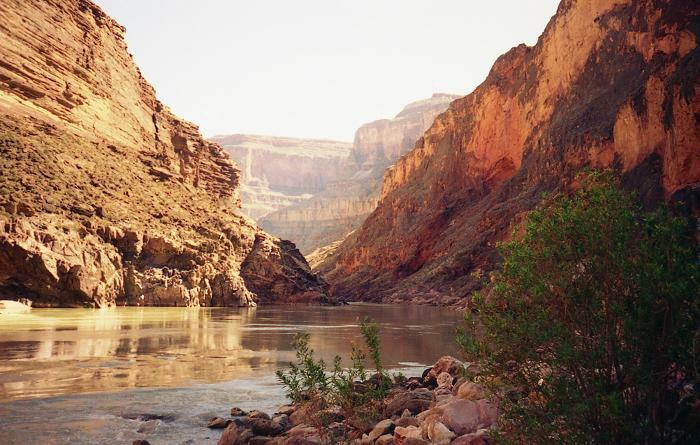 Unlike most other canyon routes, this one does not make a beeline down to the river. That was a relief for our aging muscles and joints when Barb, Stan and Joe did this route in March 1994. You follow the South Bass Trail for only about 1,200 feet of vertical descent, then exit onto the level and scenic Esplanade trail and head west to Royal Arch Canyon. 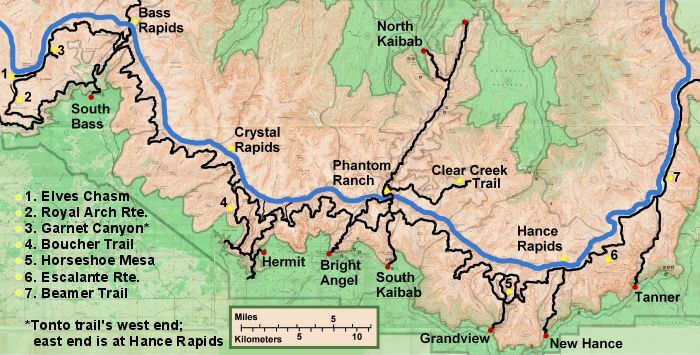 The map that comes with the Backcountry Trip Planner shows where the trail enters Royal Arch Canyon. Be sure you mark the spot on whatever map you carry with you. We hadnt, and we wasted 90 minutes descending the wrong arm of Royal Arch Canyon and backtracking. The Colorado River at Royal Arch Canyon. A few hours farther down, the trail leaves Royal Arch Canyon about two miles short of the Colorado River. A huge cairn marks the eastward exit. But dont leave Royal Arch Canyon just yet: A side hike down to the arch is a must. Take off your packs and follow the drainage about three-quarters of a mile. 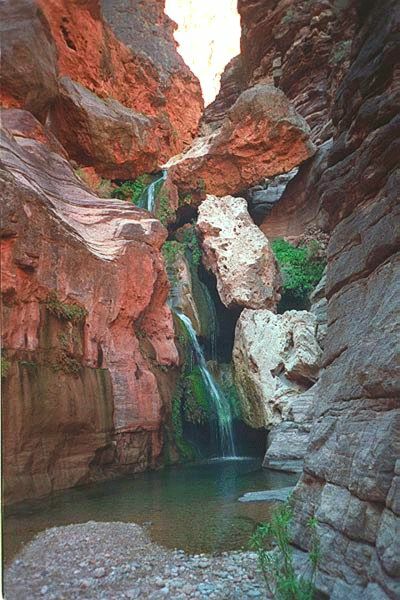 Just short of the arch, the canyon narrows and the creek emerges from the ground, creating a cool, lush oasis where youll want to stay awhile. The arch is not far from the river and Elves Chasm, but a 200-foot dropoff blocks the way. So back up the drainage you must go to your packs and the exit point. 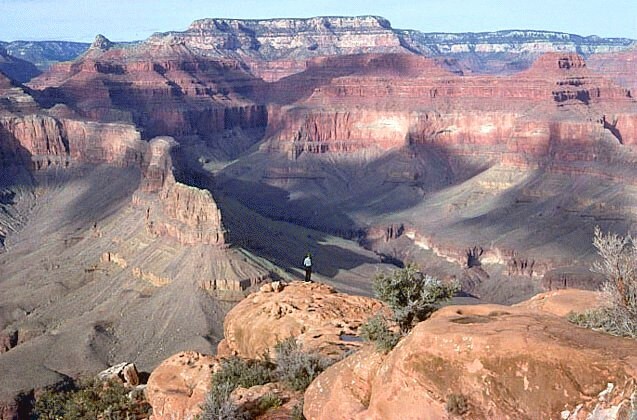 The trail climbs out of Royal Arch Canyon and onto the Tonto Plateau. 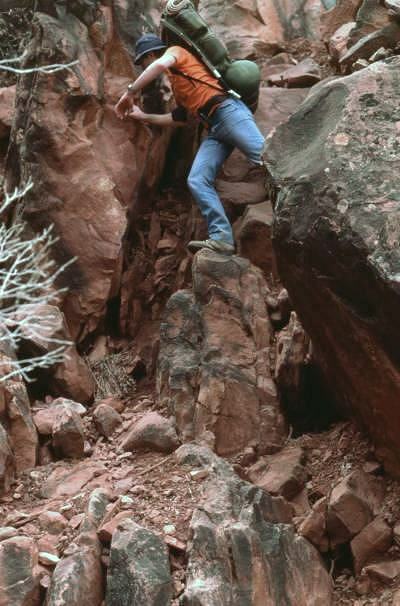 A rappel of about 20 feet is required in the cliffs on the way down to the river. The trail reaches the river at the Toltec drainage, which is a good camping spot. An extra night here will allow you an easy day hike west to the pools and waterfalls of Elves Chasm, which is off-limits to camping. Its about an hours hike each way. Wear gloves to protect your hands from the jagged travertine limestone boulders you come in contact with along the way. And take a water bag to stock up on creek water; unless it has rained recently, youll probably be drinking river water at Toltec. The hike east to Bass Canyon is typical Tonto Trail hiking: into a side canyon, then out onto the plateau. 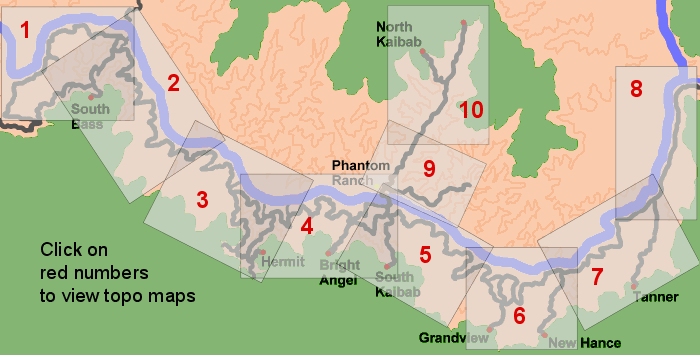 Side canyon, plateau; side canyon, plateau; over and over again. The plateau, with its broad vistas and stunning views of the Colorado River a thousand feet below, is as rewarding as the side canyons are grueling. Eventually, you reach Bass Canyon for the climb back up to the South Rim. Pray that it hasnt rained up top during your stay, because the road through Pasture Wash can swallow up jeeps when its muddy. This is another way to reach Elves Chasm, and you dont have to rappel. The minuses: You wont see the Royal Arch area, and the hike is an out-and-back instead of a loop. This route is basically the second half of the Royal Arch Route (described above), done in reverse. One stop worth adding is Bass Rapids, where marooned in the rocks for the last 80 years has been a metal boat believed to have been built by legendary riverman Bert Loper. When we camped there in spring of 1978 and 1980, creek water trickled down the tall cliff beside the river, forming a pleasant little waterfall and drinking-water source. This stretch of the canyon used to be home to many wild burros, descendants of animals brought in by prospectors and miners. Their loud nighttime baying was a pleasure to hear, but they also caused trouble by competing for habitat with the native species and creating trails that led unwitting hikers far off the Tonto Trail. 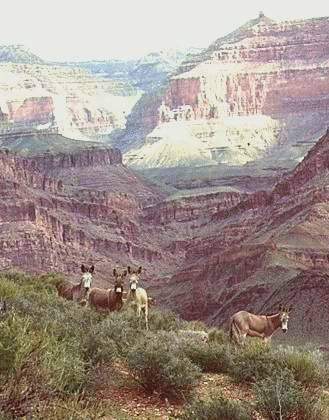 The Park Service removed the burros from the canyon in the early 1980s. Wild burros on the Tonto west of Bass Canyon. West of Bass Canyon, we have found seasonal water in Copper and Garnet canyons in March and early April. But one year we had to search long and hard in Copper to find any. Garnet has the more reliable supply, though its taste is a little salty. Garnet Canyon could serve as your base camp for a day hike west to Elves, but its probably two and a half hours each way, making it a very long day of hiking. Instead, consider camping farther west at Toltec drainage — just an hour from Elves. Matt near the Boucher Trail above Columbus Point. Stan, Roger and Joe hiked this 38-mile route in March 1987. Stan returned a year later and did the route again, with Barb. It was her first canyon hike, and she suffered sunburn, nosebleeds, blisters, everything but a scorpion sting, but shes been back every year since. And she and Stan got married — at the canyon, of course — in 1993. Just for the record, this route includes the stretch that Colin Fletcher, the man who walked through time, hiked naked. After the South Bass descent comes a 22-mile stretch of Tonto Trail that we had all to ourselves in March of 87. We went five days without seeing another human, but we did have some company: a small herd of desert bighorn sheep just east of Turquoise Canyon. There were plenty of water sources along the way: seasonal streams in Serpentine, Ruby, Turquoise and Slate, plus the permanent stream in Boucher. The camp at Turquoise was heaven: we slept on a large outcropping about 15 feet above the streambed. A spring trickled out of the ground just a few yards away. A hummingbird occasionally buzzed by. We could have spent the whole week there, but of course we had to move on. Slate Canyon has a giant, shade-making boulder to camp next to. A side trail follows the streambed down to the river, where if youre lucky youll see rafts shooting the notorious Crystal Rapids. Slate Canyon is where, in 1992, we were wakened just before dawn by what sounded like a train rumbling through. In an instant we realized it was an earthquake — 4 on the Richter scale, we later learned. Marlenes constipation was suddenly a thing of the past. At Boucher Creek, prepare yourself for a most strenuous ascent to the rim. Its doable in a day, but we usually spend a night partway up, on the scenic promontory above Columbus Point. This is a dry camp except for possible water pockets in the rock, so youll probably need to haul water up from Boucher Creek, making the 2,400 feet of vertical gain even more of a grind. The Boucher Trail ends at Dripping Springs trail near the top of Hermit Canyon. You turn left and soon reach Hermit Trail, which takes you to the rim. Another way to approach this area of the canyon is to start on the Hermit Trail, easily reached at Hermits Rest. The Boucher Trail descent is the most unnerving one Ive done in the canyon. 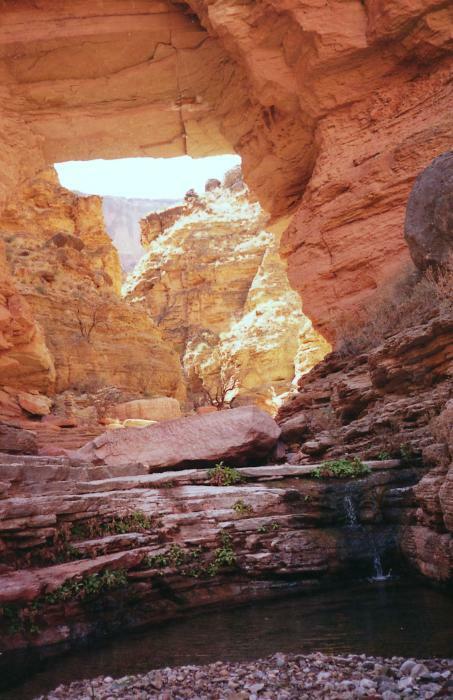 Poor footing and steep terrain through the Supai Group make it downright dangerous when going downhill. An alternate route: Stay on Hermit all the way to the Tonto Trail and head west. All text & photos © 1995-2007 by Joe Hudson & the Grand Canyon Junkies, except as noted. All rights reserved.